Pointe du Hoc, a prominent position along the coast of Normandy, was a focal point of the amphibious assault by U.S. forces during the early morning hours of D-Day, 6 June 1944. The cliff top (sometimes referred to as Pointe du Hoe) is located between Utah and Omaha Beaches and sits atop overhanging cliffs up to 100 feet in height. The careful and thorough planning of the Normandy invasion determined that several key missions would require painstakingly accurate execution in order for the invasion to go as planned, and one of those missions was the capture of Pointe du Hoc. As such, Allied planners named Pointe du Hoc one of the most dangerous German defensive positions on the Norman coast. Early on in the war, following their defeat of France in June 1940 and occupation of the northern part of the country, the Germans came to understand the strategic importance of Pointe du Hoc. As a part of their defensive system along the Norman coast known as the Atlantic Wall and established under the direction of Field Marshal Erwin Rommel, the Germans installed a battery of 155mm guns on top of the cliff. The guns had a range of approximately 20,000 yards and could cover both Utah and Omaha Beaches with artillery fire. Defended by elements of the 716th and 352d Infantry Divisions, along with artillerymen, Pointe du Hoc became a heavily fortified bastion for the Wehrmacht that threatened the lives of the thousands of American soldiers who would soon be landing on the nearby beachheads. On D-Day, Rudder and his force from the 2d Ranger Battalion, made up of 225 soldiers, along with Lieutenant Colonel Max Schneider and the 5th Ranger Battalion in support, would carry out the mission to scale these cliffs before dawn on that fateful day and neutralize enemy positions atop Pointe du Hoc. Rudder, who had commanded the 2d Ranger Battalion since its activation on 1 April 1943 at Camp Forrest, Tennessee, was largely responsible for developing the plan for his Rangers on D-Day. (The 1st through 4th Ranger Battalions were officially redesignated as Ranger Infantry Battalions on 1 August 1943.) The plan called for the use of a force consisting of three separate elements in the form of Force A, B, and C. Force A consisted of Companies D, E, and F, 2d Ranger Battalion, and would land just below Point du Hoc. The assault teams would come ashore in a group of nine British-crewed Landing Craft Assault (LCA) boats carrying twenty-two men each. LCAs 668 and 858 would carry Company D. LCAs 861, 862, 888, and 722 would transport Company E and Rudder’s command element, while Company F would occupy LCAs 887, 884, and 883. In addition to the LCAs, four DUKW amphibious vehicles equipped with extension ladders, acquired from the London Fire Department, would accompany Force A. 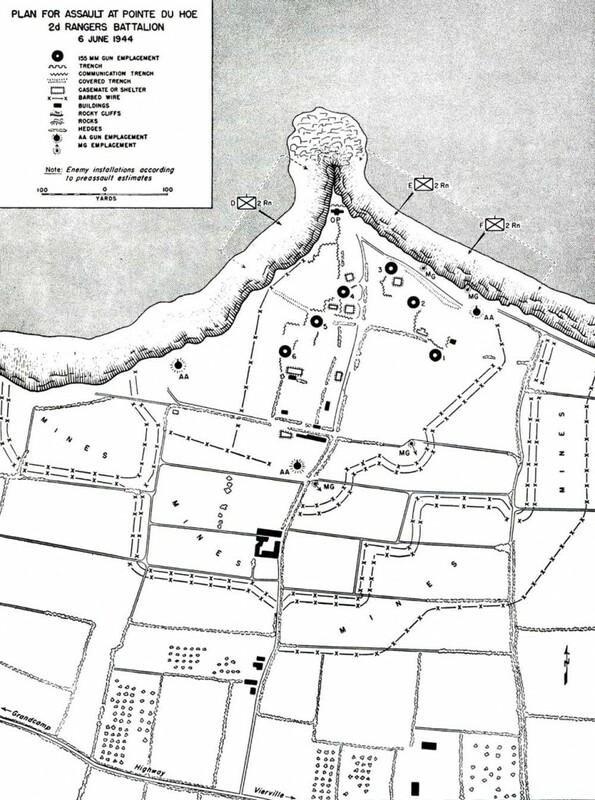 Companies E and F would land on the eastern side of Pointe du Hoc; Company D would land on the west. Additionally, a twelve-man fire-support group comprised of U.S. Navy personnel and a forward observer from the 58th Armored Field Artillery Battalion would accompany Rudder’s headquarters. Lieutenant Colonel Schneider, with the 5th Ranger Battalion and Companies A and B, 2d Ranger Battalion (Force C) were to remain offshore for approximately thirty minutes until they received a signal from Rudder’s force ordering them to follow Rudder’s assault team ashore. In the event that Rudder’s mission to capture the guns atop Pointe du Hoc failed, it would become the mission of Schneider’s force to capture the position. To accomplish such a task, Schneider would send Companies A and B, 2d Ranger Battalion, and the 5th Ranger Battalion to the Dog Green sector of Omaha Beach, behind Company A, 116th Infantry, 29th Infantry Division, and Company C, 2d Ranger Battalion. After landing, Schneider and his force would take Pointe du Hoc via an overland attack. Force B, led by Captain Ralph Goranson and comprised of Company C, 2d Ranger Battalion, had its own unique mission. The plan was for Company C to land on Omaha Charlie beach, located to the right of where the 116th would be landing. Upon reaching Omaha, Force B would climb the cliffs of Pointe de la Percée. Like Pointe du Hoc, Pointe de la Percée played host to German strongpoints and required the Rangers of Company C to destroy them. Percée, located about three miles to the west of where Force A would land at Pointe du Hoc, required a climb of approximately ninety feet. Following their ascent up Pointe de la Percée and the destruction of enemy positions atop the cliff, Company C would move east along the cliff side in the direction of Pointe du Hoc destroying any enemy positions they came into contact with until their eventual link up with the Rangers of Force A at Pointe du Hoc. Due to the nature of the mission, scaling cliffs obviously became a major part of Ranger training, and Rudder’s Rangers spent a considerable amount of time learning, practicing, and reviewing to ensure their minds and bodies were in shape for what many considered to be a suicide mission. 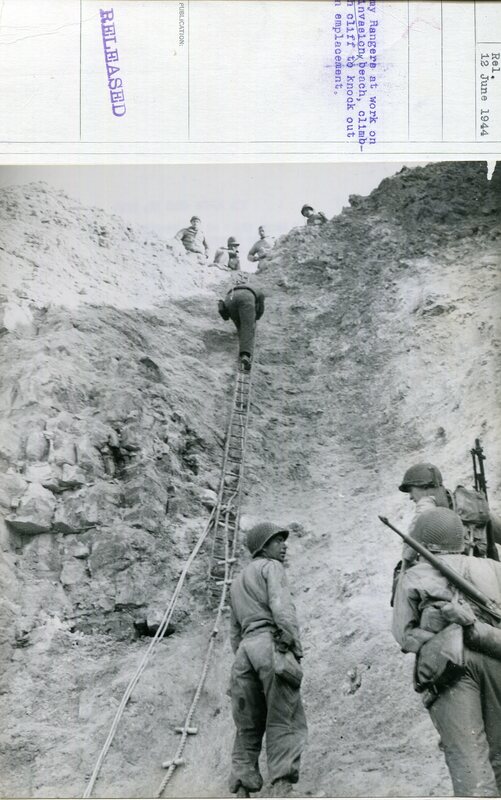 While the Rangers received some instruction from British commandos, who had experience in coastal raids against German positions on the French coast, the Rangers mostly learned cliff climbing by good old trial and error. The Rangers practiced with various types of ropes and ladders. 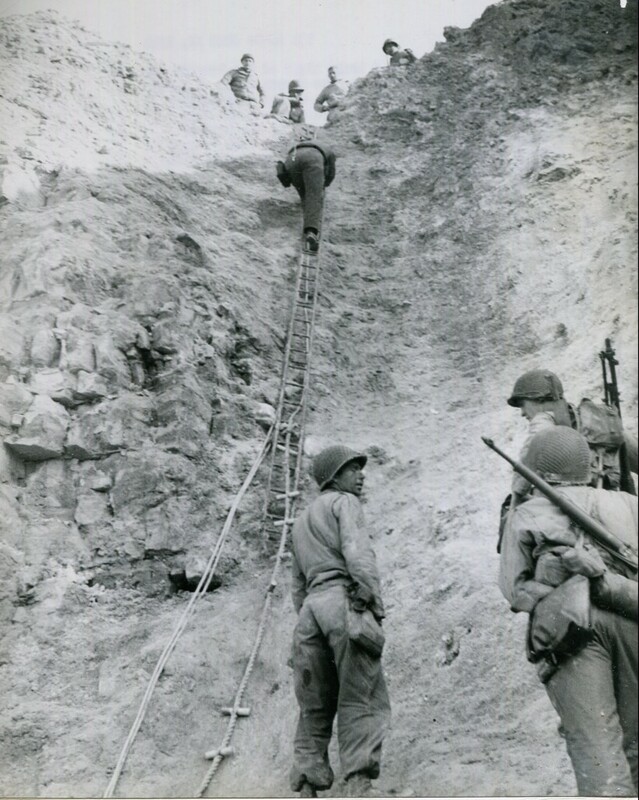 Rocket-fired, grapnel-equipped ropes eventually become the primary tool of choice when ascending the cliffs of Pointe du Hoc. In the weeks leading up to D-Day, the Rangers trained, developed, and tested their newly formed skills on various cliffs along the English coast and on the Isle of Wight. At 0445 on the morning 6 June, Companies D, E, and F, 2d Ranger Battalion (Force A), boarded their designated LCAs and headed out into the choppy sea for an hour-long trip to their destination. Riding in the landing craft was rough and cold, and several Rangers became seasick. Others worked vigorously to empty water out of the boats in an effort to keep them from sinking. One LCA capsized, leaving the assault team with twenty-two less men for the mission. At 0645, as the men of Company C landed on the shore of Omaha Beach, they were immediately subjected to German artillery fire. Before even making it to shore, the lead craft was hit by artillery fire and the company lost its first fifteen men. A second LCA was also hit with incoming fire and the fifteen men aboard this craft were either killed or wounded. Roughly ten minutes or so after the landing of Company A, 116th Infantry Regiment, 29th Infantry Division, the remaining Rangers of Company C landed and fought their way to the base of the cliff to begin the ninety-foot ascent to the top of Pointe de la Percée. Upon reaching the base of the cliff, Captain Ralph E. Goranson soon realized that of his original seventy-man team, only thirty-five were left to climb the cliffs. By nightfall, that number would fall closer to twelve. Upon reaching the cliff top, the Rangers immediately set out on patrol, knocking out enemy strongpoints atop the cliff and moving their way towards their fellow Rangers of the 2d Ranger Battalion at Pointe du Hoc. While the Rangers of Company C were already climbing the cliff side of Pointe de la Percée, Rudder’s Rangers had not yet made it to shore. H-Hour was set for 0630, but as the early morning sun began to rise, the Rangers of Force A quickly realized that something was wrong. The cliffs in their line of sight were actually Pointe de la Percée and not Pointe du Hoc. The waters were choppy and the current so strong that it caused the Rangers to travel some three miles off course of their objective. Once back on track, the Rangers were now well behind schedule. Naval ships watching the landing craft travel ashore were responsible for laying covering fire. However, because the Rangers were scheduled to land on the beach at 0630, the naval ships ceased their covering fire at 0625. Because of their navigational mishap, the Rangers did not land on the beach until 0710, nearly forty minutes after their scheduled time. The delay gave the Germans enough time to recuperate, reposition their defenses, and lay heavy gunfire on the incoming Rangers from companies D, E, and F. The Rangers, no longer able to follow Rudder’s original plan, were now instructed to land all companies to the east of Pointe du Hoc on a strip of beach about 500 yards long and thirty yards wide. They came under heavy fire from the Germans while coming ashore. As the soldiers at the front exited the landing craft, the Rangers toward the rear laid down covering fire as their comrades ran to shore and took shelter in a small cave at the base of the cliff or in craters along the narrow beach. Each LCA was equipped with a grapnel-tipped rocket; behind the rocket was a box that contained coiled rope and each box contained a different rope set. The first was made up of ¾-inch ropes, another had rope with short pieces of wood called “toggles”, and the last consisted of rope ladders. Each LCA was also packed with two portable rockets and lightweight rope. This allowed for them to be carried ashore by the Rangers and fired from the beach. The choppy seas and spray of seawater, however, had caused the climbing ropes to become extremely wet, increasing their weight and making it difficult for the rocket-fired ropes to make it to the cliffs and take hold. Some of the ropes that caught the cliffs were cut by the Germans. Though many ropes never caught hold or were cut, there were still enough to allow the Rangers to scale the cliffs. The Rangers were also assisted by the fact that the naval and air bombardment had knocked off portions of the cliff and created a pile of rubble forty feet in height; the soldiers placed sections of ladder against the cliff face from atop the pile and had a relatively short and easy climb to the top. On the other hand, the ladder-equipped DUKWs accompanying Force A could not maneuver across the cratered beach and did not contribute to the efforts to scale the cliffs. The Rangers experienced much difficulty climbing up the cliffs that day. Many of the ropes that caught hold of the cliffs that morning were completely covered by enemy fire, making the number available for climbing severely limited. The wet ropes were slippery and soldiers were weighed down by damp uniforms and mud clinging to their clothes, boots and equipment. German bullets and “potato masher” grenades rained down from above. 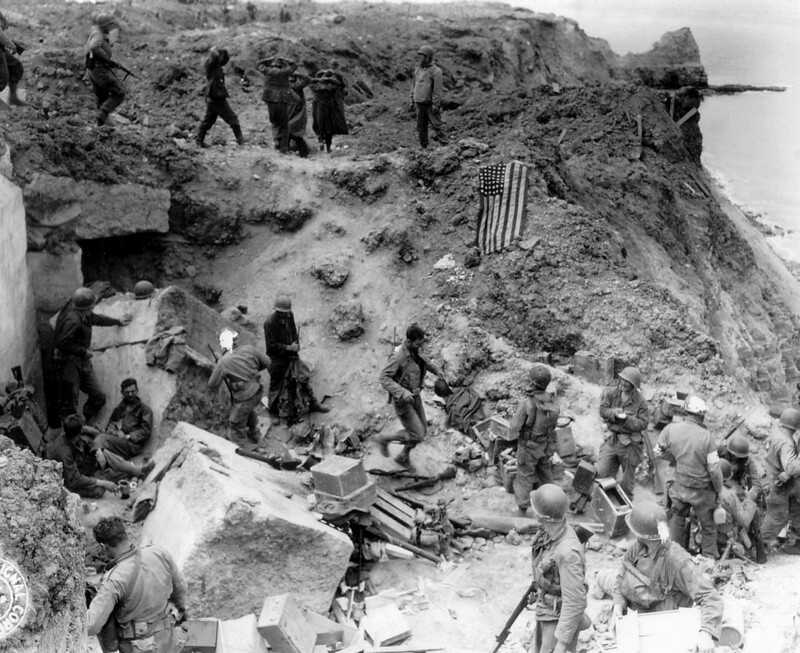 Nevertheless, the Rangers climbed to the top of Pointe du Hoc while under enemy fire. Several German soldiers were killed and others driven off from the cliff edges when Rangers opened fire on them with Browning Automatic Rifles (BARs). The preparation for Operation OVERLORD included an intense aerial bombing campaign on Normandy and the rest of northern France. Air strikes targeting Pointe du Hoc took place on 25 April, 21-22 May, and 4-5 June, and these were followed by naval gunfire by the battleship USS Texas and destroyers USS Satterlee and HMS Talybont on the morning of 6 June. Once the Rangers reached the top, they were astonished by the destruction they found. Nothing resembled the aerial photographs and sand tables the Rangers had studied prior to the mission. Any recognizable landmark had been replaced with craters and rubble. According to the original assault plan, Force A was to land at 0630, leaving Schneider and Force C to wait offshore for the signal to follow the three companies of Force A ashore by thirty minutes. If no signal was received by 0700, Schneider was instructed to land his force at the Dog Green sector of Omaha Beach and take Pointe du Hoc by a land assault. Schneider and his force anxiously waited long past the 0700 mark for the arrival of the designated signal from Rudder’s forces that they had made a successful landing. Lieutenant James W. “Ike” Eikner, the communications officer for Rudder’s 2d Battalion, developed Force A’s communication plan. Once atop the cliff, Eikner and his communication team would use a series of mortar flares and predetermined radio signals to alert Schneider and his force to land and begin their climb to the top. By 0713, Rudder’s communication team was working quickly to get the communication radios set up. Eikner, along with Rangers Lou Lisko, C.S. Parker, and Stephen Liscinsky worked to get a line of communication by way of SCR-284 and SCR-300 radios. Around 0725, the codeword TILT was radioed to Schneider’s forces and acknowledgment was received. However, it is unclear who sent the acknowledgment signal; there was no indication on Schneider’s end that any signal had been received from Rudder. Schneider’s force received a rather unintelligible message sent at 0715, the only understandable word being “Charlie.” Schneider went forward with the contingency plan and led Force C to Omaha, where they would storm the beach and attempt to reach Pointe du Hoc by an overland assault. At Omaha, Force C landed at Vierville-sur-mer. The first two waves of Schneider’s force took heavy fire upon their approach to the beach. Seeing this, Schneider diverted the rest of his men to land just a mile to the east landing between Dog White and Dog Red sectors. Despite the intense artillery fire that covered their approach, thirteen of the fourteen LCAs in Schneider’s force landed safely, with the 5th Ranger Battalion suffering six casualties. Fighting their way across the beach and over the sea wall, the battalion was directed by the 29th Division to stay and help establish a beachhead instead of moving forward with their original plan of pushing toward Pointe du Hoc. 1st Platoon, Company A, 5th Ranger Battalion, however, became separated from the rest of the Rangers and, unable to establish contact, set off on foot to connect with the Rangers at Pointe du Hoc. The rest of the 5th Battalion remained in Vierville overnight, defending the right flank of the beachhead against German counterattacks. Atop Pointe du Hoc, the Rangers of Force A formed into small groups and took off toward their assigned objectives—the elimination of the observation post and guns. In the planning stages of the mission, each gun position atop Pointe du Hoc was assigned a number. Company D was assigned the task of eliminating guns numbered four, five, and six, all located on the western point of the cliff. 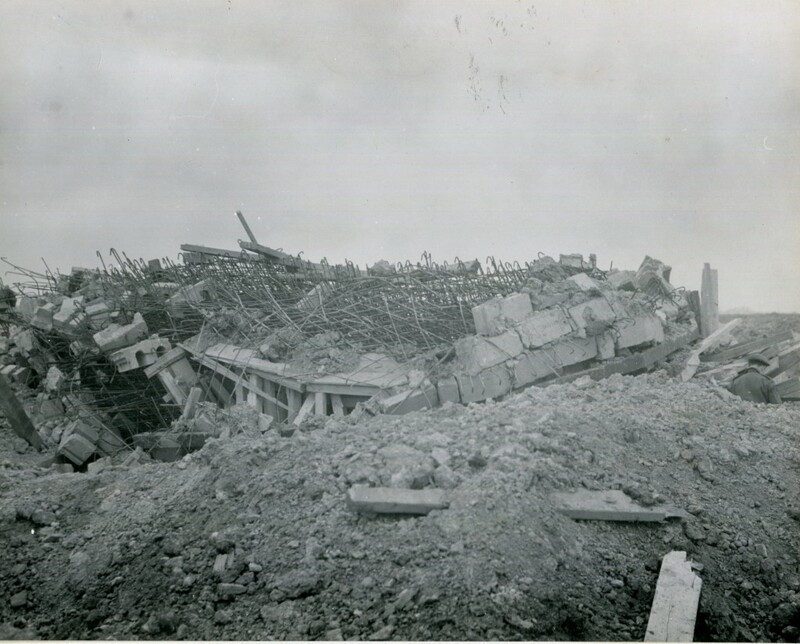 Company E was to destroy the observation post and gun number three, and F Company would destroy guns numbered one and two, as well as the antiaircraft gun positioned on the eastern sector of the cliff top. The Rangers soon took their first prisoners and sent them back down to the cliffs to the narrow beach below, where Rudder had set up his command post (CP). A group of Rangers immediately turned their attention to the concrete OP near the tip of the point. While the Rangers silenced a German machine gun and managed to place some grenades and bazooka rounds into the fortified position through its firing slits, several German soldiers remained holed up in the OP. Not until the following day, when demolition charges were brought up from the beach, was the OP finally neutralized and the eight German soldiers manning the post taken prisoner. As the other Rangers moved toward their objectives, they soon realized that the Germans had moved the guns; many of the emplacements/casemates, damaged by the Allied bombardment, held only dummy guns made out of painted telephone posts. Two days before the attack, the Germans moved the guns away from Pointe du Hoc. After discovering that the guns had been repositioned, the Rangers regrouped and set out under intermittent sniper, automatic weapons, and mortar and artillery fire to find the new locations of the artillery. In addition to trying to locate the German guns, the Rangers moved inland toward their secondary mission, which involved establishing a roadblock along the coastal road that connected Grandcamp and Vierville. The Rangers also set up defensive positions and waited for the arrival of the 116th Infantry advancing inland from Omaha Beach. During this period, the Rangers were joined by three paratroopers of the 101st Airborne Division who landed far from their drop zone some fifteen miles away. At around 0900, a two-man patrol from Company D consisting of First Sergeant Leonard Lommell and Staff Sergeant Jack E. Kuhn stumbled into a camouflaged gun position approximately 250 yards south of the coastal highway and discovered five of the six missing 155mm guns (the sixth was never found) and large quantities of ammunition. With Kuhn covering him, Lommell went to work destroying the guns. He dispatched two of them by placing thermite grenades in the guns’ recoil mechanisms, effectively fusing the parts together. After smashing the sights of a third gun, Lommell returned to friendly lines to acquire more thermite grenades, but upon arriving back at the gun position, he found that a second patrol from Company E had finished the job. The Rangers returned to their lines, but not before tossing grenades into the powder charges and starting a large fire. A runner was also sent off to let Lieutenant Colonel Rudder, who had moved his CP to the top of the cliffs, knew that the guns, the main focus of the assault on Pointe du Hoc, had been located and eliminated. 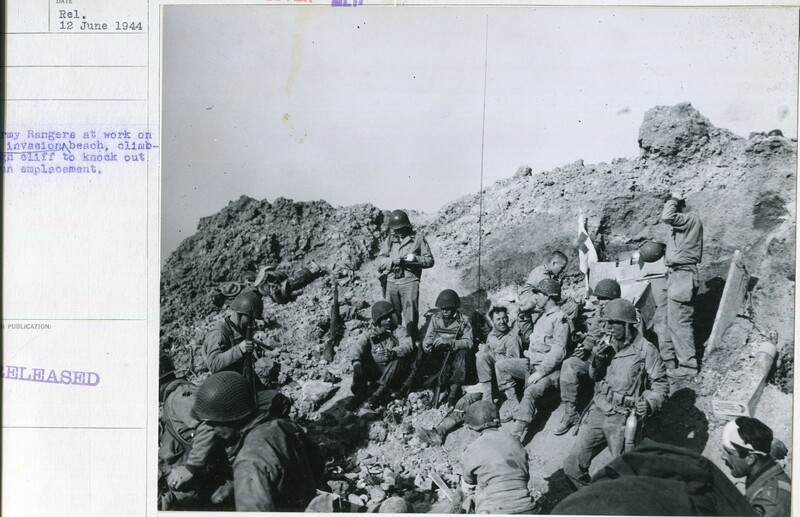 Throughout the rest of the day and into the night, the Rangers maintained their positions along and forward of the coastal highway, enduring German snipers, artillery fire, and counterattacks. At around 2100, the Rangers received reinforcements with the arrival of First Lieutenant Charles H. Parker and his 1st Platoon, Company A, 5th Ranger Battalion, which had become separated in the confusion at Omaha Beach and marched overland to Pointe du Hoc. During the night, beginning at 2300, the Germans launched a series of three strong counterattacks against the Rangers’ lines. The final attack at 0300 on 7 June drove the Rangers back to their lines just north of the coastal highway. Several men from Company E were killed or captured, while a number of Rangers from Company D did not hear the order to withdraw and were cut off. While some made it back to friendly positions, several were forced to hide among the hedgerows and ditches to avoid capture. While discovery by the Germans was certainly a problem for the Rangers, another cause for concern was friendly fire as shells from Allied ships supporting the landings fell perilously close the American positions. By the following morning, Rudder’s force had a little less than 100 men still capable of fighting. Food and ammunition was also becoming scarce, although a landing craft bearing ammunition and a small number of reinforcements arrived at Point du Hoc later on D+1. In desperate need of reinforcements and expecting further German counterattacks, the 2d Rangers at Pointe du Hoc sent a message to the 116th Infantry asking for permission for the 5th Rangers and the rest of the 2d to push through. Permission was denied as the 116th Infantry suffered serious causalities coming in from the beach and through multiple German counterattacks on the morning of 7 June, forcing Major General Charles T. Gerhardt, commander of the 29th Infantry Division, to deploy four Ranger companies of the 5th Battalion to protect Vierville and the division headquarters. A small relief force broke through during the evening of 7 June, with a larger relief force arriving the following morning (D+1) consisting of all three battalions of the 116th Infantry. 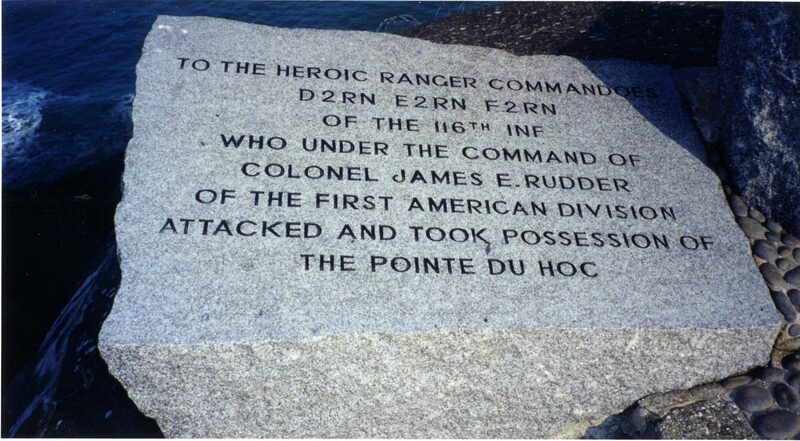 Following their actions Pointe du Hoc on 6-8 June 1944, Rudder’s Rangers suffered a seventy percent casualty rate. Less than seventy-five of the original 225 who came ashore on 6 June were fit for duty. Of those who served in the 2d Ranger Battalion on D-Day, seventy-seven were killed and 152 wounded. Another thirty-eight were listed as missing. In the 5th Battalion, casualties numbered twenty-three killed, eighty-nine wounded, and two missing. Among the casualties was Lieutenant Colonel Rudder, who was wounded twice and later awarded the Distinguished Service Cross (DSC) for his actions at Pointe du Hoc. 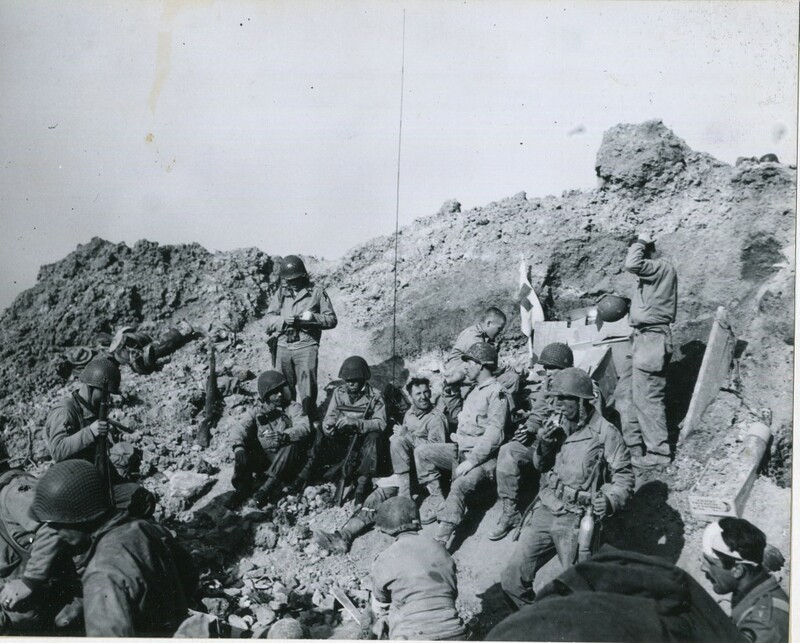 Thirteen other Rangers also received the DSC for heroism at Pointe du Hoc, and the 2d Ranger Battalion was awarded a Presidential Unit Citation for capturing the position. The 2d Ranger Battalion would valiantly serve its way through the rest of World War II, but would never again use the special skills they trained for. 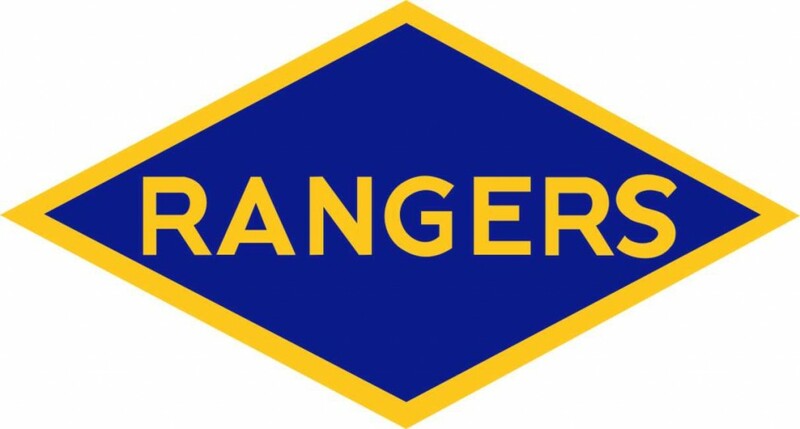 Serving alongside various infantry units, the 2d Ranger Battalion took part in operations at Cherbourg, Brest, the Crozon Peninsula, Le Fret, the Hürtgen Forest, and other locations in the European Theater. Today, 2d Battalion, 75th Ranger Regiment, is descended from the 2d Ranger Battalion. Today, a monument to the 2d Ranger Battalion sits atop a cliff eight miles or so west of the Normandy American Cemetery and Memorial . 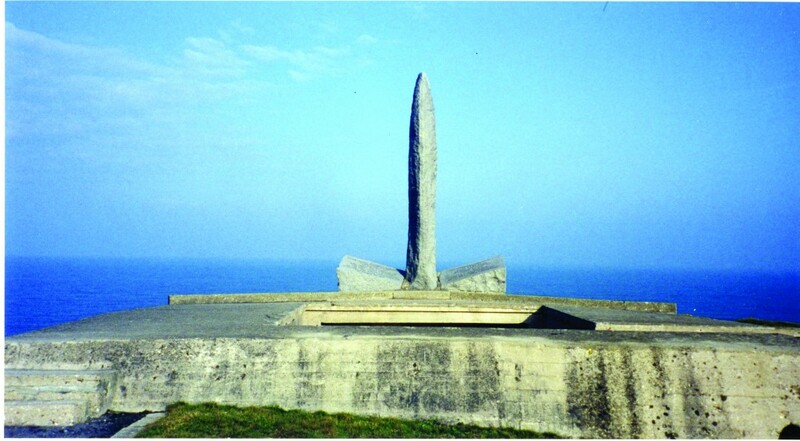 The Pointe du Hoc Ranger Monument was erected by the French to honor the men of the 2d Rangers and their accomplishments on D-Day. The monument, formally transferred to the American Battle Monuments Commission on 11 January 1979, consists of a granite pylon positioned atop a German concrete bunker with tablets in both French and English at the base. It was the site where President Ronald Reagan gave his famous “Boys of Pointe du Hoc” address on 6 June 1984 as part of the fortieth anniversary of D-Day commemoration ceremonies, and it remains a highlight of any D-Day-related tour of Normandy.